These beans are legend. They date to the ancient world, so the story goes. Supposedly an archaeological team found these beans within a New Mexico cave, sealed inside an Anasazi clay pot for 1,500 years. The beans germinated, and today we have an abundance of these speckled little beauties, akin to the pinto. 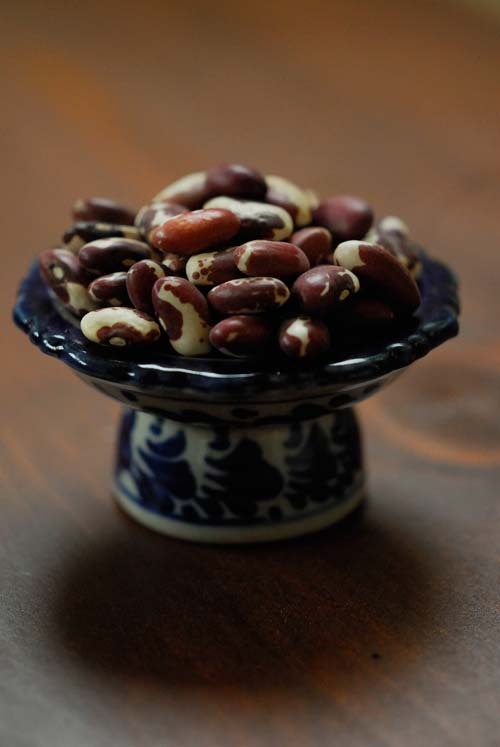 Among their numerous names: Anasazi beans, New Mexico cave beans, Aztec beans, New Mexico appaloosa. Now, it’s not necessarily entirely likely a bean could sprout and grow after so much time in the dark. Believe what you will. Call them what you want. But understand: these are nice beans. They taste good, they’re easy to cook, and they make a fine alternative to the usuals. It’s always good to add a new specimen to the diet. Rinse beans, cover with water and soak over night. Add more water, bring to boil and simmer until beans are tender. (Time will vary depending on how long the beans soaked, how many beans you have and your elevation. But I found these beans to cook very quickly, in about 25 minutes.) When beans are the desired tenderness, remove from heat and rinse. Let cool. Meanwhile, sautÃ© garlic in oil until golden. Add garlic to beans and mix with olive oil (enough to give the beans a luscious texture), oregano, salt, a twist of fresh lemon and a sprinkle of white balsamic vinegar. Add chile and mix again (I used hot Kashmiri, but any will do). Feel free to use different herbs. Rosemary is a wonderful accompaniment to beans such as these. Dunk the sprigs into boiled water for a moment to release the herbâ€™s aroma. Chop and add to beans as you would the oregano. Serve at room temperature. And think of the ancient ones. As naturally healthy as the diet of the Aztecs and Mayans was it is good to see up to date versions of their staple beans used in recipes. Thanks for the informative and interesting story of the rediscovery of this bean with many names, the Anasazi. Wonderfully written article and I will try the salad recipe for sure. Thanks again. Thanks for visiting, George. I hope you enjoy the beans. I think they are similar to pintos, but they cook more quickly (at least at our elevation they do). And I love their look. I absolutely love these beans. When I taught Utah history (fourth grade!) I used to cook them in the crockpot at school for our “Anasazi Feast.” I would send home a list of other foods the Anasazi peoples ate, and all the kids would bring foods to share along with the beans. Hi Kalyn, I would love to know more about your Anasazi feast and the types of foods you shared with your students….